To attention of all watch lovers the information watch portal montre24.com presents an exclusive video clip of the company Alpina, which took an active part in the annual exhibition BaselWorld 2012. The pavilion of the company Alpina was no differ by especial decoration: in small glass window were presented the novelties of Alpina 2012. The pavilion of Alpina was the logical culmination of a giant pavilion of the company Frederique Constant, as if demonstrating the dominant position of Frederique Constant. It is no coincidence, as the company Alpina is a division of Frederique Constant. Apparently, the organizers felt that Alpina should be given such a minor role. But we should not underestimate the brand Alpina: it is a strong brand with a clear positioning system and the most important thing for the watch industry and its major clients - is, of course, the history: history of Alpina goes far in 1883. Throughout its existence the company Alpina is inextricably linked with the world of sports, which is why all watches Alpina characterized by high accuracy, extreme reliability and comfort in use. Because of the certain circumstances the presented video clip does not have such an informative set as the others. However, it presents the main novelties of the company Alpina at the annual exhibition BaselWorld 2012. In the presented range of Alpina watches has been clearly traced a vintage style in a fairly competent and interesting design. Also was presented pilot's watch line, thanks to which the company Alpina has acquired its widespread popularity. The company Alpina also introduced a series of chronographs. To see more clearly these latest novelties of Alpina at the BaselWorld 2012 is possible by clicking on the following link - http://montre24.com/video/134/. 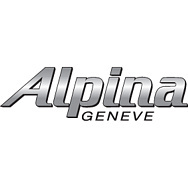 Official site of Alpina watches. At the international exhibition BaselWorld 2014, which this year will take place from March 27 to April 3 in Basel (Switzerland) , the watch brand Alpina will introduce its new model Startimer Pilot Automatic Chronograph “Black Star”. As an addition to the pilot`s landmark collection Alpina Startimer, the new model Alpina Startimer Pilot Automatic «Sunstar» (Ref. AL-525GB4S6) with a dial adorned with a radiant finish, applied hour markers and minute ring, possesses all the specific characteristics required for the pilot`s watches. As an addition to the iconic Alpina ”Startimer Pilot” professional pilot collection the all black Startimer Pilot ”Black Star”, with its black PVD coated stainless steel case, ”sunray” dial finishing, applied numerals and applied minutes ring, maintains all the professional pilot features the Alpina Startimer Collection is known for, while adding the luxury finishes normally found on elegant watches. The company Alpina announces a new watch Startimer Pilot Worldtimer, presented in a round case with a diameter of 44 mm stainless steel. Water-resistant - 100 meters. The new limited editions watch Startimer Pilot Chronograph Sunray (Réf. AL-860GB4S6) by the Swiss watch company Alpina is made in a classic style. The novelty 300 Extreme Diver 300 Orange of the Swiss watch brand Alpina has a classic dive style. The Swiss watch company Alpina at the international exhibition BaselWorld 2013, taking place in the current year from April 25 to May 2, has unveiled a new watch - 130 Heritage Pilot Automatic Chronograph. At the international exhibition BaselWorld 2013, the Swiss watch brand Alpina has introduced a diver's watch Extreme Diver 300 Chronograph. Alpina Sailing Yachttimer Countdown Watch for lovers of sailing races! The Sailing collection, created in collaboration with the watchmaker Alpina and Italian Extreme 40 Niceforyou sailing team, is replenished with a new model - Yachttimer Countdown. Swiss watchmaker Alpina offers two new models from the Diver Midsize collection, developed by the masters of the brand especially for those who want to enjoy the beauty of the underwater world and explore the depths of the ocean. On July 27 this year, the company Alpina introduced in New York its extended the line of Extreme Diver Collection (base line established in March of that year). "Face" of the new sporty series has become a famous actor William Baldwin. Alpina is not the first watch company which tried his hand in the field of watchmaking, in any way connected with the world of motorsport. What happened - judge for you? It seems that summer dictates its own rules, not only in fashion but also for the watch companies. Most manufacturers during the summer season present novelties, something related to the type of summer vacation. Recently, Swiss watchmaker Alpina Geneve has made an unexpected announcement: the company is going to sponsor a Swan 80 yacht, this year taking part in a regatta in the Mediterranean. The watch company Alpina announces the release of its novelty under the name Worldtimer. The model, which is part of the Alpina Aviation collection, has been developed in close cooperation with Cessna Aircraft and PrivatAir. Informational watch portal Montre24.com provides a unique opportunity to all fans of watch making, which closely follow the latest developments in the watch industry, make acquaintance with models of the watch company Alpina, presented at the annual exhibition GTE 2012. Swiss watch brand Alpina has unveiled a new collection of watches Startimer Classic Collection, design patterns included in it, is inspired chronographs of the company, released by the 20-30's. The Swiss watch brand Alpina has introduced the new wristwatch Startimer Classic Chrono Automatic, performed in a trendy vintage style. Design of the novelty is matched with the strict lines of the pilot's watches that Alpina has produced in a far 20s-30s of the last century.